It’s a fact of high school athletic life that there is nearly always some roster turnover, as seniors leave programs and as underclassmen fill their roster spots. It’s also a fact that this turnover hits teams with varying degrees of severity. 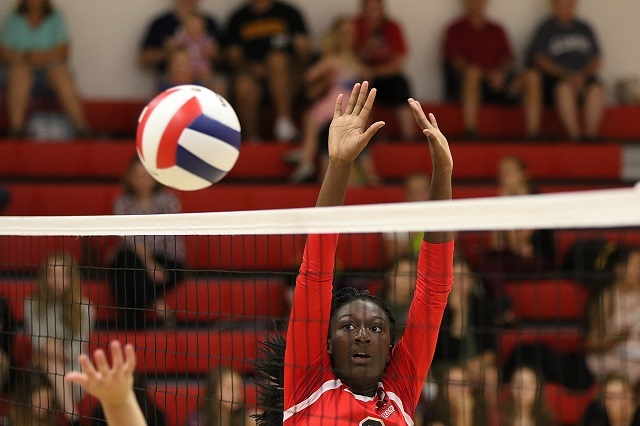 For Mooseheart’s volleyball team, the new faces are everywhere. That includes on the bench. While Lindsey Burcham coached the Ramblers in the postseason as an interim coach last fall, she is now the head coach of the program, and her team opened its 2018 campaign on Tuesday with a 25-20, 25-15 defeat to Indian Creek. “When they saw the size of the team – 50 girls — they were a little intimidated, but I’m happy with how they did,” Burcham said. Mooseheart has only one senior – Britney Tovar – on the court this season, and the bulk of last year’s team graduated, taking many years of varsity competition with them. Though the Ramblers are younger and less experienced this season, they held their own against the visiting Timberwolves on Tuesday. “I want to continue to see their teamwork and to see them grow. As long as the keep that going, they will be OK. I think they were a little nervous tonight, with it being their first match of the season and with the other team having 50 girls,” Burcham said. Tovar, the team’s only senior, is the team’s captain and she has stepped confidently into that role. The Ramblers also have four juniors and five sophomores on a youthful roster. “She’s really stepped up as a motivator, keeping the girls knowing what they’re supposed to be doing in practice and always having a good comment,” Burcham said. Through preseason and into the season opener, Burcham said she has seen encouraging signs. The Ramblers have time to prepare for their Aug. 31 second match of the season, another home match, this time against Kirkland Hiawatha. In moments of adversity – where Indian Creek strung points together or found holes in the Ramblers defense either for serving aces or scoring hits — Burcham was she was pleased with her team’s attitude.